Size UK 16. Fully lined in polyester matching coloured silky look material. I was going to repair it but I didn't want to appear to be trying to cover it up. Other than that it is clean and perfect with plenty of wear left in it. Marks & Spencer’s Grey Ladies Winter Coat Size 10. Condition is Used. Dispatched with Royal Mail 2nd Class. Condition is g oo d ju st a l it tl e ar ea of wear on a rm s ee p ic tu re. Pi t to p it 4 2” l en gt h 42 ” ex tr a lo ng. On label is a N SP CC g re en f ul l st op pin. L ef t on because it h as m ar ke d th e fa br ic h ow ev er another br oo ch a s re pl ac em en t wi ll c ov er. Navy M&S Wool & Angora Belted Coat, 16 Long, Excellent Condition. I bought this coat on eBay recently but it’s too big for me. I was really disappointed because it’s a really lovely classic coat. I’ve had the coat cleaned since I bought it. Please do not hesitate to ask any questions. From a smoke and pet free home, Please take a look at my other listings. Thanks for looking. Marks and Spencer tweed effect Wool Coat. Beautiful classical oversize coat in smart beige textured shade. So chic and elegant. Fully lined with pockets on front and button fastening. 100% wool - so warm and cosy. Good Condition. May have the odd but of wear from use but nothing major and no holes or anything. Length (Shoulder to hem) 34". Marks And Spencer Grey Wool Cashmere Mix Long Belted Coat, UK 12, Immaculate. Stunning coat, UK 12, Marks and Spencer’s, worth over £100 new I would think, due to the materials used and the heaviness of the coat. Quality, heavy coat. Dry clean only. Stunning, classical cut, clean lines. M&S PURE WOOL HERRINGBONE DOUBLE BREASTED TWEED COAT SIZE 12. Length 46"
CURRENT DESIGN - DOUBLE BREASTED & VERY FLATTERING. 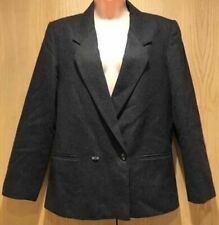 MARKS & SPENCER - BEAUTIFUL QUALITY 100% PURE WOOL COAT size 12 Standard. THIS IS A BEAUTIFUL HEAVY DUTY, SUPERIOR QUALITY WINTER COAT for the coming Season. Beautiful coat from MARKS & SPENCER. Size UK 10. 70% wool and fully lined. Self tie belt. Big patch pockets. Labelled as Extra Long length. Deep vent centre back. Raglan style sleeves. Beautiful full length blue wool coat. Worn twice. Great condition. A real classic with soft rounded shoulders. Concealed single breasted buttons. Soft brush wool mix. This is a very nice M&S long brown wool mix coat size 16 in a vGC. New listingM&S Marks & Spencer Wool Blend Blue Long Coat Size UK 12 Length 52"
M&S Marks & Spencer Wool Blue Long Coat Size UK 12 for sale in excellent condition. 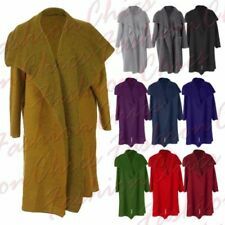 It's long coat for Tall ladies 52" length from collar to hem. This is a stunning coat designed by M&S. In preloved condition, may require a wash. hence over sea price increase which reflects this. It's full length, features button fastening. small stains to front. LADIES MARKS AND SPENCER TWIGGY COLLECTION. LONG WAISTCOAT ONE SIZE. BLACK AND CREAM DESIGN WITH OPEN. Lovely purple wool coat which I bought in M&S back in the late 90s I think. Too small for these days so I have decided to sell it on. Full length wrap style, with single hidden button and tie belt. Self coloured Mongolian sheepskin collar, which is removable. Narrow wool collar underneath. Wool is lovely and soft. Fully lined. Length from back of collar to hem approx 110cm. It is marked size 12, but I think it is quite small by today’s standards so would possibly better fit someone who is size 10. Hardly worn, so still in excellent condition. Has been stored hanging up in a garment bag to protect. Smoke and pet free home. UK buyers only please. Condition is Used, subtle check pattern, see pics of lining. Ladies wool coat, light brown, good condition. Lined. Marks and Spencer size 10 (on the large side of a 10). 100% Pure New Wool with Woolmark. Fully lined. Vent at the back 41cm (16”). Lining – polyester. Dry clean only. In excellent condition, hardly ever worn. Marks And Spencer Light Weight Wool Coat Size 14. Lovely brown nutmeg colour. 50% wool with Alpaca snd mohair mix which give the cost a cosy feel. Longer length. Two pockets with rear pleat. Button fly front. The collar can be worn buttoned, open or turned down. From smoke and pet free home. M&S Marks & Spencer Wool Blue Long Coat Size UK 12 Length 52"
MARKS & SPENCER Ladies Fur Collar Wool Coat Full Length. Colour: Beige. Size: UK 14/42. Hardly worn in excellent clean condition. BNWT RRP £99 : Fabulous Navy Multi Wool mix Knee length Duster Coat Size 12 Condition is New with tags. This lovely warm stylish black coat is in excellent condition. It is from M&S and made with 80% wool and really soft. The label says a 10 but I would say that it is more like a 12. A really stylish, soft, warm, long coat for the winter months.